Easter Family Brunch was the theme of the Lunch With Friends class at Grace-Marie’s Kitchen at Bristol Farms in Manhattan Beach last week. Who doesn’t look forward to a holiday brunch, with delicious dishes set out on the board and you get to fill your plate to your heart’s content and your tummy’s satisfaction. The dishes Grace-Marie prepared for this brunch would do anyone proud, including, Brunch Roasted Shrimp and Pineapple Salad, Easter Banana Muffins, “Croque-Madame” Brunch Gratin and Springtime Apricot Cake. Has your mouth started watering yet? I hadn’t been to class for a while and it was like coming home. The bustle of food being prepared, Grace-Marie joking with the students and the feeling of anticipation in the room. Everyone was hungry and there was much friendly chatter amongst the friends waiting for Grace-Marie to begin. However, unbeknownst to Grace-Marie, this was a very special day for her, which had been organized by her many students for their beloved teacher. 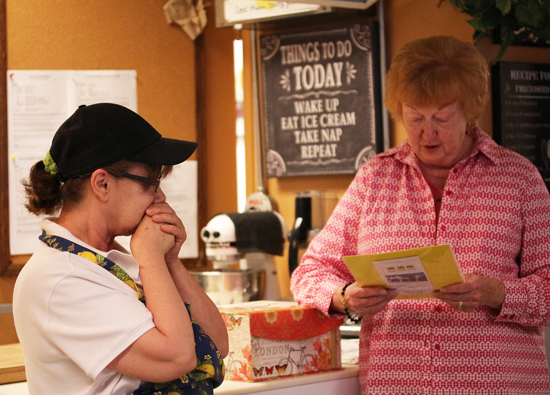 Right after Grace-Marie had said her first words of the class, her friend and student of many years, Pat Bagge, came to the front of class and presented Grace-Marie with a gift box and card signed by about 100 of her students to celebrate her 20 years at the helm of Grace-Marie’s Kitchen. 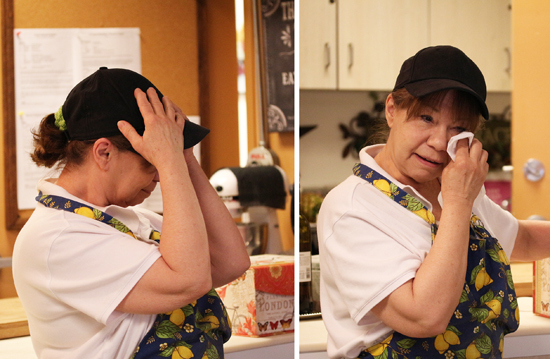 Pat read a heartfelt letter extolling all the reasons her students loved her and Grace-Marie, being the sweet and tenderhearted person that she is, dissolved into a puddle of tears right before our eyes. She was so happy and touched. 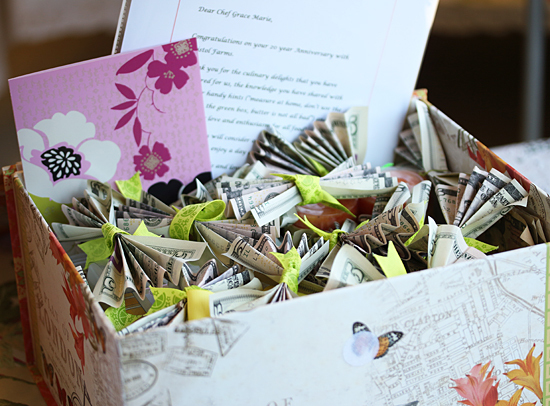 The gift box was filled with goodies given by everyone. I heard someone recommend a day spa they thought would be enjoyable. There were scented candles and little jars of potions, too. 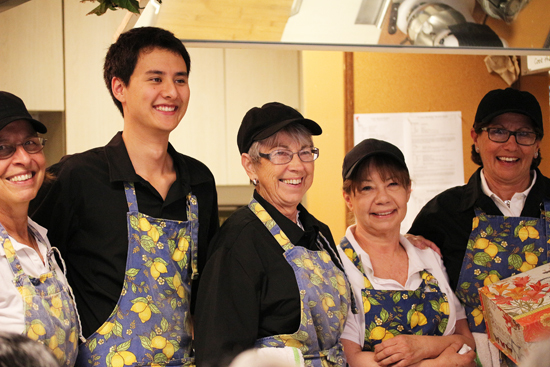 A beaming Grace-Marie recovered and posed for this photo with her trusty kitchen helpers, giving a huge thanks to everyone for celebrating her 20 Year Anniversary in such a beautiful way. And then she went to work …. To start the salad, Grace-Marie demonstrated how to prepare the pineapple, cutting off the ends and the sides. The slices have the core cut out with a little cookie cutter. The pineapple, sprinkled with brown sugar, and shrimp are roasted in the oven. The cucumbers are cored and sliced. Everything goes in layers in a big bowl, awaiting the vinaigrette to be added at the last minute. A Vidalia Onion Vinaigrette is the basis for the dressing and Grace-Marie chose Virginia Brand, although you could use the brand of your choice, or even a poppy seed dressing. To that is added the juice and zest of an orange and some Dijon mustard and it is blended to perfection. Really tasty. This was a huge bowl of salad for about 30 people with lovely colors and textures, and was piled on top of the roasted pineapple slices. The class got one slice of pineapple for their brunch and I, on the other hand, got three slices for my photogenic plate. I am so lucky! 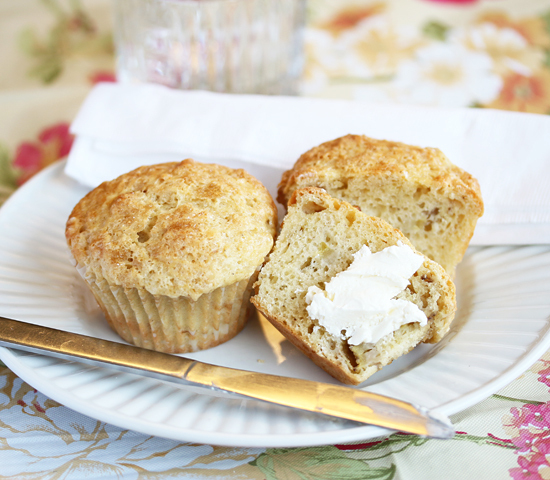 Along with our salad we also had these scrumptious Banana Muffins. They had a really nice texture and light banana flavor. The banana slices were folded into the batter, which was a new method for me. The recipe is below. Happy 20 Year Anniversary Grace-Marie. Thank you for your inspiration and friendship. 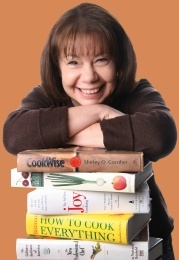 Click here for the Easter Brunch recipes from 2010 from Grace-Marie’s Kitchen. 1. Preheat oven to 400 degrees F. Line two baking sheet pans with parchment paper. 2. Directly onto one pan combine shrimp, oil, salt, pepper and seasoning, if using. Toss, scatter out in single layer. 3. 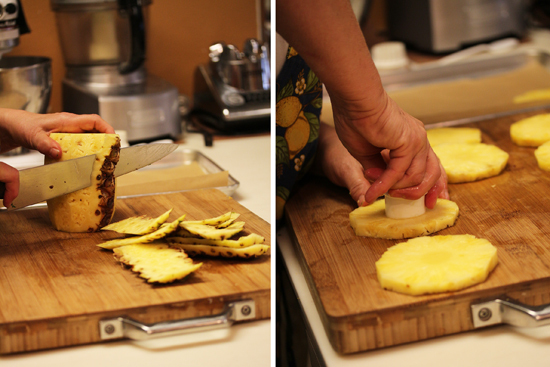 On second pan, arrange pineapple slices in single layer. Sprinkle brown sugar over each. 4. 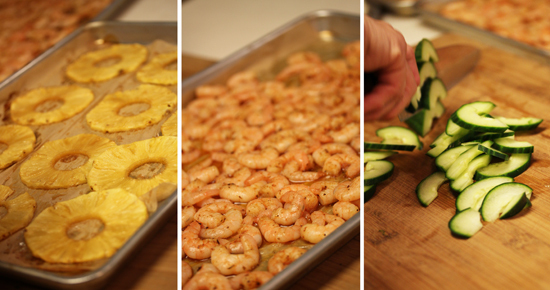 Roast both pans until shrimp are pink and the pineapple begins to soften and top browns lightly (10 minutes). Cool both to room temperature on pans. 1. 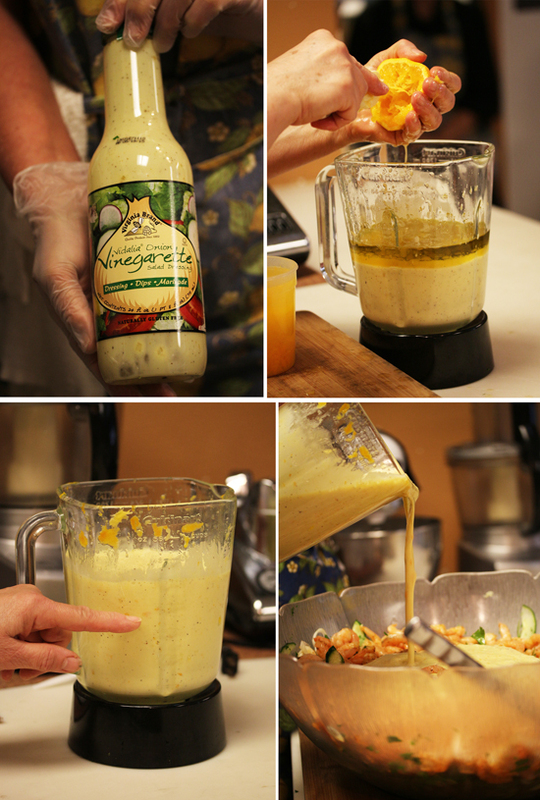 Combine vinaigrette, orange zest and juice, and mustard in large salad bowl. Whisk to blend well, then season with salt and pepper. Add roasted shrimp (without pan juices) and toss. 2. 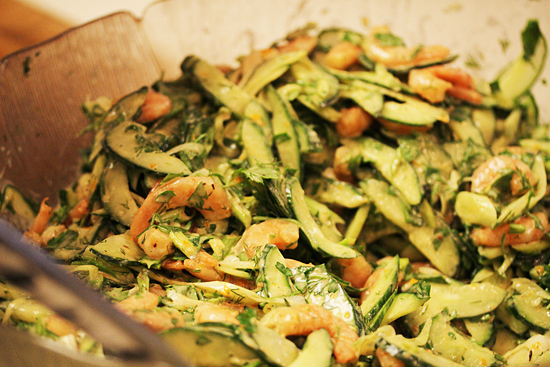 As cucumbers, onions, parsley and dill are prepared, layer them onto the shrimp salad. Once complete, toss to mix well. Cover and refrigerate if not using immediately. 1. Place one roasted pineapple round onto each serving plate. 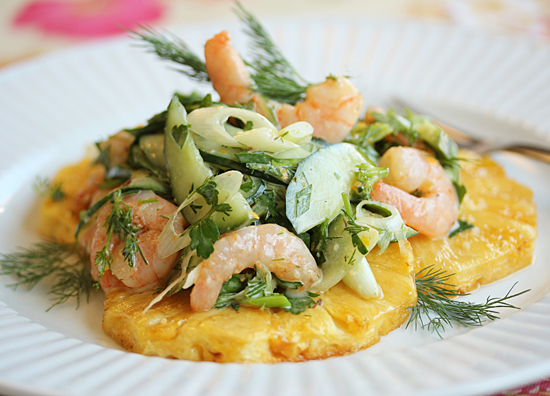 Top with portion of salad and garnish with any remaining herbs used in recipe. 1. Preheat oven to 350 degrees F. Line a 12-cup muffin pan with paper liners, lightly coat them with cooking spray. Place pan onto a parchment lined baking sheet pan. 2. In a large mixing bowl, whisk together flour, baking powder, baking soda, salt and allspice. 3. In second large mixing bowl, whisk together sugar, milk, sour cream, eggs, butter and vanilla extract (or use blender on lowest speed). Add milk mixture to dry ingredients and, by hand, fold together until all dry ingredients disappear into the mixture. 4. Scatter banana slices over batter, fold in to incorporate and, using an ice cream scooper, fill muffin cups ¾ full with mixture. Sprinkle the raw sugar over the tops. 5. Bake until muffins have risen, are golden brown and spring back in centers when lihtly touched with your fingertip (20+ minutes). 6. Cool in pan for 10 minutes, then carefully remove and transfer to wire rack to cool completely (or serve slightly warm).